Did it really go to the States? Well here it is in the States for the filming of "The Betsy" (and yes that is a young Tommy Lee Jones) which was released in early 1978 and it was out here for KB to drive in the 1978 Rothmans Series in February so this must have been taken in 1977? that B&W picture link in the Hemmings blog is my photo. They must have crimped it from Bernard Cowdrey's book on F5000's. I seem to recall at various stages either in RCN, or Auto Action, or Chequred Flag, or one of the other publications floating around at that time that the BT43 was incorrectly described as an "ex F1 car" implying that (like John McCormack's McLaren M23 and Alan Hamilton's Tiga modified McLaren M26) the BT43 had been reengined from being Cosworth DFV powered. I don't know how or why this incorrect perception got around but it did seem to pop up now and again (even into the 1980 season when the CAMS Rules allowed cars other than F5000 such as F1 cars and Formula Pacifics when the BT43 was still rumoured to be in the country, supposedly had been repaired, and "could" be reengined as an F1 car!) until corrected by those in the know. Obviously as everyone here knows it was a "one-off" F5000 with it's basic heritage from the BT40 F2 car and some of the design philosophy/concept from initially the BT42 and then the BT44. "Bartlett was a fixture of Formula 5000 throughout the 70s with a series of Lolas and briefly a modified Brabham Formula One." Anyone here with Wikipedia access able to correct it? Edited by oldjonesfan, 23 November 2013 - 11:53. A late '73 A/Sport reported that Fred Opert was hoping to run a 2 car team of BT43s in US F5000 for the 74 series, Reuteman and W Fittipaldi being mentioned. Was this just gossip, or any reality to it I wonder? Fast Freddie never ventured into 5000/CanAm did he? 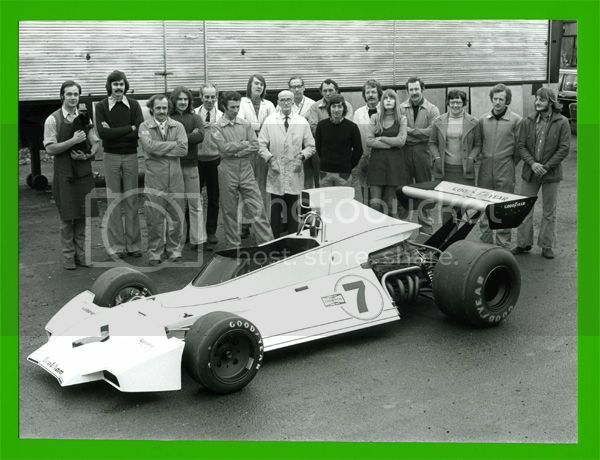 That BT44 roll out pic, 4th from the left (as you look at it) is that NDS???!!!!!!!! I'd put money on it, Herbie looks very young!! The names all look OK to me. The missing last one is Ian Taylour who is now in Australia. Nick G is holding "Mum" - the works cat. I don'trecall Jenny's last name but she and Ian Hilton had a bit of a thing going. 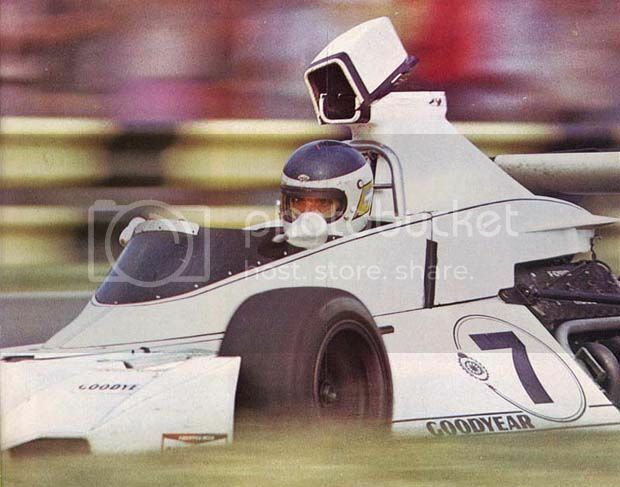 Why did the BT44 originally have such a tiny airbox? What was the thinking behind that? Edited by oldjonesfan, 30 November 2013 - 12:32. Would you know what issue that was in? Managed to find the time when I was Home to look at the Photos and can now describe what's on them. 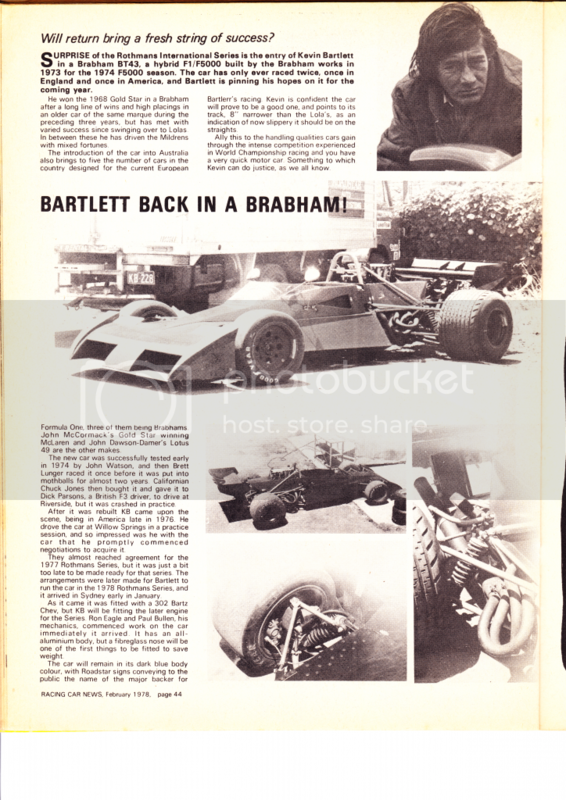 Also managed to find some old Racing Car News I saved (despite giving most of the others away) and lo and behold one of the ones I saved had the article of the BT43 arriving in Australia for KB. I've scanned it as a pdf (average size) and a bmp (quite large) - which is the best to upload here? So as said before and going by the Reference Numbers the BT42 Rollout was obviously well before BT43 Rollout. It's a pity I didn't get the BT44 Photos as their Reference Numbers would place when the BT43 Rollout was in relation to it's Rollout. Edited by 275 GTB-4, 15 November 2014 - 20:28. I just tried it with Postimage, actually, it seems it automatically converted the .bmp to a .png file. Imageshack is doing the same, so you don't strike the obstacle of not being able to post it, you have posted that from Photobucket, so obviously it's happening there too. However, the file size is seriously reduced if you change the file to a .jpg. Edited by Ray Bell, 15 November 2014 - 21:26. Now I'm confused.....but that's easy to do. Smart man that KB - the Lola limp stopped a lot of drivers getting around the paddock easily. I am of course making a terrible assumption as to when this photo was taken and whether KB was using the bike for that reason. A useless post this one !. That car sure got around. US, UK, Oz and just about every pic has a different front wing, or at least variations. Airbox too. How many meetings did that car actually do? And it seems it was crashed often too. Is KB around? he should know, he crashed it last. What was that? a wheel failure I think. How many meetings did that car actually do? But it looks like it has a Lola airbox in the last race. the hero of the hour Derek Reed, above, who bravely stood above the Kevin and the ticking time bomb of a BT43 should the worst happen and KB need to get pulled out ! I believe the car in the background is Johnnie Walkers Lola T332 with the T330 HU23 plate if this is correct did the car still have the Repco Holden fitted ? AND is it John or Johnnie I have seen both used regardless of hemisphere ? This car was Chevrolet powered. Thanks Ray, do you know when Johnny switched from the Repco Holden to the Chev ? In 1976 he sold his Lola (to Peter Edwards?) and was without a car for a while. He was offered the drive of Max Stewart's second car, but when Max was killed that put an end to that. But that weekend Martin Sampson offered him the drive of his T332. @-) Gosh Ray, just to get this clear Johnny Walker won the 1979 Australian Drivers Championship in Martin Sampson's Lola Chev seen in the photo following KB at Sandown 9/9/79 ? The reason I ask is because the T332 plated T330 HU23 runs in the Magnum wheels livery over here, I guess that may have led to some inncorrect assumptions. Should have looked in the "Getting a lift" thread. 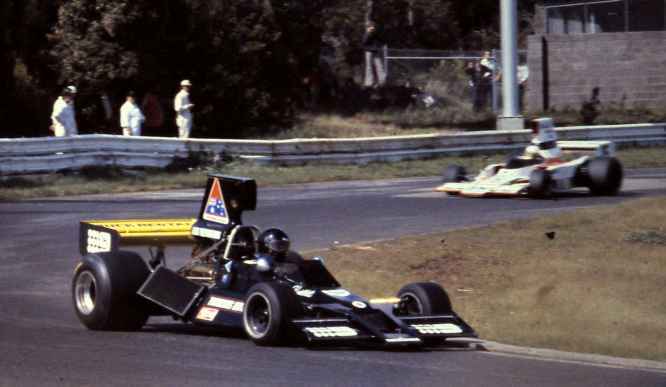 Following a recent Facebook item on KB's Brabham BT 43 F5000 I would like to add my contribution. As Bob Paton will recall, I was employed by MRD in the winter of 1972/3 as a detail assembler of production parts for BT 41/42s. My main task was to put the "Brabham" touch onto parts bought in for outside suppliers... Jack Knight steering racks, setting up the discs and calipers on the Hewlands, fitting bearings to front and rear uprights and so forth. I was racing a Palliser WDF2 Formula Ford and it just so happened that some of the parts were very similar to earlier Brabham bits. I recall that Bob allowed me to refurbish the Palliser's steering rack along with a tranche of BT41/2 racks. The rack had been bent in a prang at Oulton Park and I needed to rebuild the car in time for the first FF Festival at Snetterton where John Leffler, Larry Perkins and Bob Skelton had come over to contest the FF World Cup at Brands. Ex patriat, Buzz Buzaglo and I made up the five Aussie drivers at Snetterton. That event was in August-September 1972 so I must have been employed at MRD then. To come to the point of connection with the BT43 I was asked to fettle the Hewland which had been removed from the ill-fated and only once-tested BT39 Brabham Weslake which had lain in the Mill shop. Formula One car based on BT38 chassis but fitted with Weslake V12 engine and Hewland FG400 gearbox. Tested but not raced." So, if this listing is correct, it was an FG400 which I had on my bench. Later information suggests that the BT43 had a DG300 Hewland. KB and I have had some deep and meaningful discussions on this point over recent years and if the above information is true then I can only surmise that the FG was replaced by a DG by the time he drove the car in Australia. "The following is the list of larger product range up to 1981. Second geneneration of LG600, new case, selector rod and diff. I also assisted in mahandling the BT42 aluminium tub to which had been grafted a pair of triangular-shaped crushable-structure panniers. I remember that a pair of tubes had been set inside these and the whole shebang was stood on end so that expanding foam could be poured into the cavities. There was probably extra fuel tankage included in the set-up. In the early summer of 1973 my wife, Gaye, and I set off to contest the Europameisterschaft FF. We carried the Palliser in an ex-BA aircrew Bedford bus and raced at Zolder (2nd), Hockenheim (6 or 7th), Mainz-Finthen (5th), Djurslandring-Denmark (dnf punted off by a Swede), Osterrichring F1 meeting (2nd and into the lead of the championship), Anderstorp (4th), Brands Hatch GP (9th) to end up just one point behind the winner, Hans Binder. Binder won a fully-supported F3 car and went on the race in F1. Bernie Eclestone was with his F1 team in Austria and, encouraged by Peter Windsor, I asked BE if I could assist in the F1 race pits. Bernie clapped me on the shoulders and congratulated me on my performance in the support FF race. He offered me a "test drive" in the experimental narrow-track "works" F3 car. Although I rather triumphantly returned to the factory from which I had taken leave of absence for a seat fitting, the planned test day at Silverstone was cancelled. Shortly afterward, Bernie closed down the shop and the workers "let go." That would have been around August 1973. Gaye and I went home to Australia, I set up a "learn-to-drive" school, took a position with Max Stahl's Racing Car News as the advertsing manager (Hi Ray), worked with Peter Wherrett's advanced driving school (sometimes alongside KB) and eventually Gaye and I bought out the PW interests and ran Nationwide Defensive Driving School and Peter Finlay's International Racing Drivers' School until 2010. We brought the Palliser home and I raced it for two more years, the second of which in 1975 was with the Grace Bros-Levis' team when I repeated my "bridesmaid" performance by claimining a close (1 point) finish to young Paul Bernasconi. 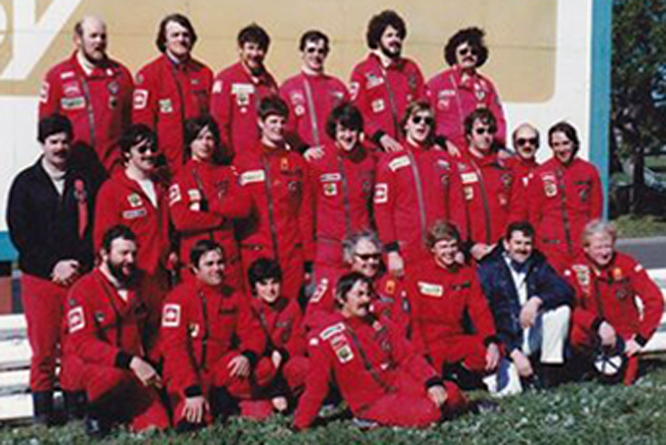 Paul went to the UK and worked for Ron Tauranac at Weylock while running an F3 Ralt. 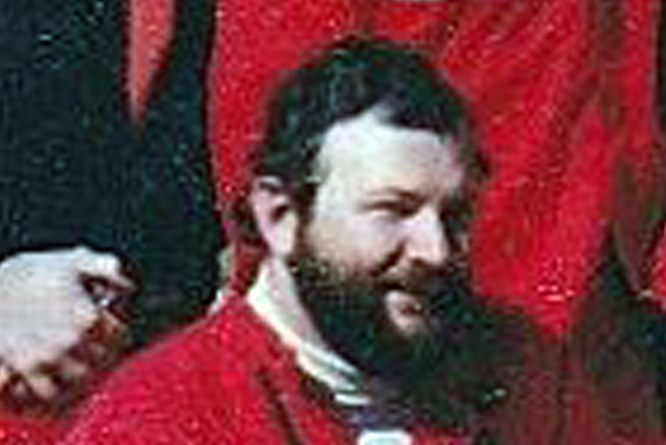 In 1992 I returned to my roots in Hillclimbing with one of the school's Formula Fords (the Mawer) and won the NSW state title as a hat trick in 1994,5,6. I took a couple of glorious runner-ups in the Australian Hillclimb Championships (the second of which was in the "works" Pilbeam MP62 at the Esses course on Mount Panorama. A three-event sortie to the UK with the Pilbeam team at Shelsley Walsh, Loton Park was a most enjoyable return to racing in the UK in 1997. My last Hillclimb car was the ex-James King March 77B F3 re-tubbed chassis (C2) (ex- Paul Hamilton et al)) fitted with a 2 litre YBM mit der kompressor and running Motec on methanol. Noisy but too heavy. I retirement I occasionally provide high-end chauffeur services and regularly fly a 3-metre wingspan model glider fitted with an "electric thermal" in the nose. My website is : www.planeimages.smugmug.com where some of my aviation photography is displayed amongst other things. Yes Doug, and it makes me wonder what it would take to get our old driver friends to do something similar. That post makes me shudder,, about those gearboxes. Dis a DG300 really only have 300 ft lb torque load? Those 5000 Chevs probably had about 400 ft lbs and the cars weighed more than F1s too. People used those boxes in Sports Sedans with well over 600hp and 500 foot lbs in cars now weighing 1125 kilo. no wonder they are fragile in that application. Question,, are DG 300s still made? Well done Peter on a great career. And yes, agree that Peter has chimed in with an impressive post. May he make many more. That was most informative and enjoyable, Peter. Not as enjoyable, however, as some of the very close Formula Vee racing we had...almost half a century ago. Probably doesn`t add much to the discussion, just an excuse to post this. Edited by rasimmo, 23 November 2015 - 08:10. Decidedly not pretty but GREAT action pic. Power oversteer and Kevin working very hard. Kevin has said that it only ran with those radiators and that nose at Sandown. Is this pre-Sandown testing? 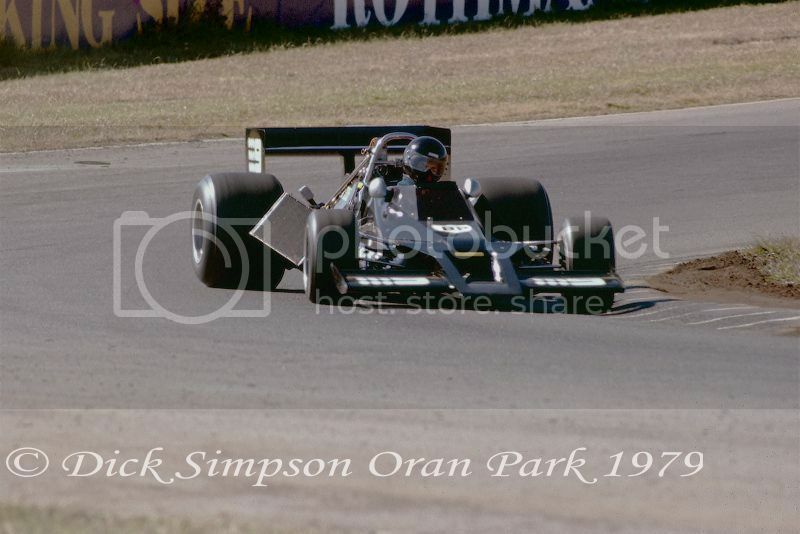 Hullo Ray, that pic was taken on Saturday the 28th July 1979 at Robin Orlando Corner, Oran Park, during practice for the 2nd round of the Australian Drivers Championship. KB was entered in the program but I don`t think he raced on Sunday. It`s a scan of an Ektacolor print film negative, so I dont have any EXIF data to back that up ( I love digital cameras ). From very unreliable memory Sandown was on in September 79. Edited by rasimmo, 23 November 2015 - 13:08. Looking at Hewland's website, it looks like they may still service DG300 but they are not part of their current range. Incidentally, they say the DG300 is good for 450 ft/lb torque.